I am happy to share with you a new book written and illustrated by Elisa Kleven. This post is part of a blog tour and book Giveaway (information at the bottom of the post). 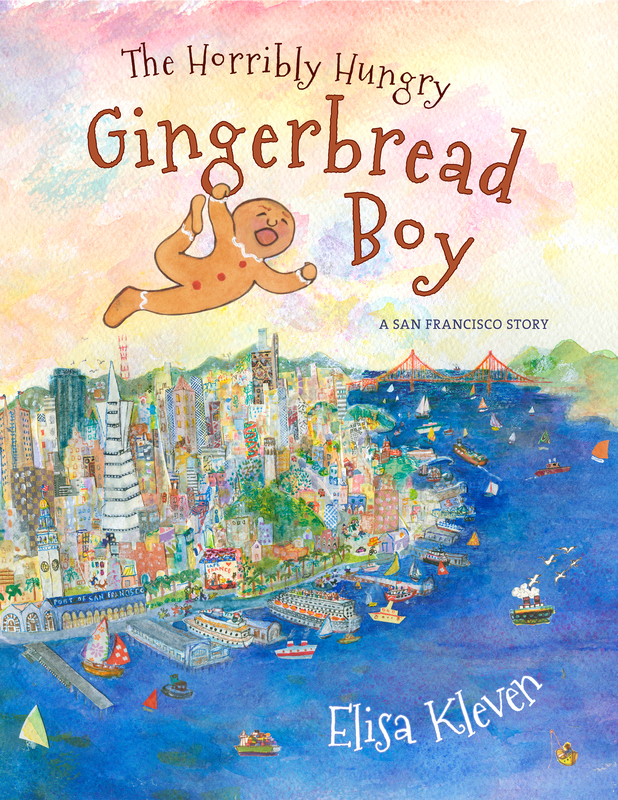 The Horribly Hungry Gingerbread Boy is a clever retelling of the traditional folk tale of the runaway cookie, set in the author’s home town of San Francisco. I have long admired Elisa’s books and in this new one, she keeps up her reputation as the queen of multi-cultural patterned motifs. Her watercolor illustrations are so packed with color and detail that both young and old can spend many an hour pouring over them. 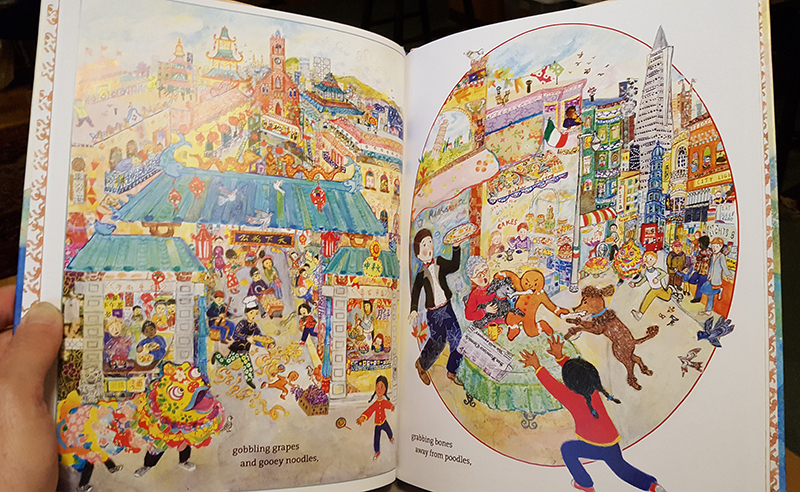 Each page is a carnival of activity, with street scenes and landscapes showing San Francisco’s many neighborhoods, buildings and the harbor. 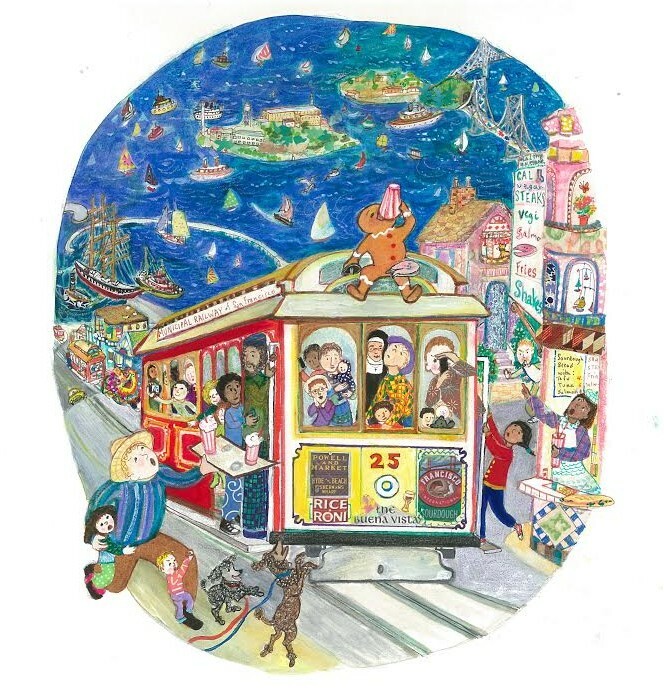 Families living in or visiting San Francisco will enjoy identifying the city’s many landmarks. The pure color palette and use of patterns is reminiscent of Persian Miniatures. And Kleven conveys a riotous energy that children will love. Copies of The Horribly Hungry Gingerbread Boy are available in bookstores and on Amazon. This entry was posted in Blog Tour, illustration by Salley Mavor. Bookmark the permalink. Thank you for this opportunity. I have enjoyed being your “friend” from the cloud world and hope this friendship continues for a long time. That looks like a lovely book. Especially since I used to live in San Francisco! I so enjoy your blog! Here’s hoping & thank you! I had all of her books In my libraries in my pre-retirement life. Love your blog! Love this new twist on an old family favorite. Thank you for the opportunity. Love her books especially Sun Bread and the paper doll books. And I love gingerbread adventures! Have a good day! Your wee folk are amazing. I’m intrigued by the artwork and reselling oh this tale! Gingersread boys are the best. I love the illustrations – such cheery colors! Looks like a fun book to read to kids. What a wonderful opportunity for an amazing book. A family tradition and a beautiful keepsake. Thank you! I so much enjoying searching out books to enjoy with my grandchildren as they grow. Thank you for introducing her books to me. What an beautifully illustrated book. I can remember as a child I always loved looking over the illustrations of my favorite books. I would never tire of them. Fun multicultural twist on this book! I see a whole series of gingerbread adventures! Please come to Albany NY with the gingerbread boy! Hello from rainy Marin County, just across the Golden Gate from San Francisco! I recently discovered Kleven’s three darling Paper Princess books and would love to add this one to my grandchildren’s library. How fun. We do a lot with Gingerbread stories. I will get this one for the collection. This looks like an adorable rendition of the traditional gingerbread man story. I see the gingerbread man has a new strength of character declaring “I’ll never be eaten”. My twin granddaughters would truly enjoy this book! My daughter and I once ran into Ms. Kleven at the San Francisco main library. We were thrilled to meet one of our favorite children’s book authors! 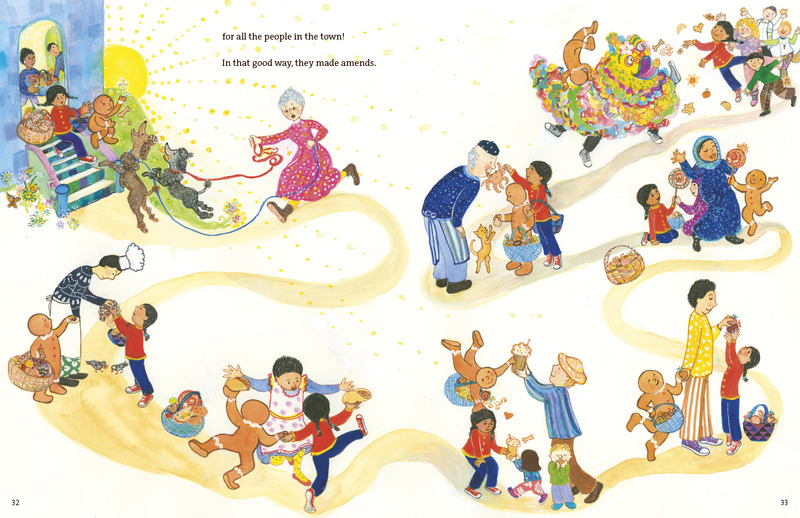 Her stories are warm and sweet and her artwork is joyful. I’m looking forward to reading her new book. Beautiful take on an old favorite! What a wonderful twist on this old classic. We love SF so it will be fun to dive into those illustrations and find the details, I already noticed the Rice A Roni ad on the back of the trolley. We are having a snow day here, and now I’m thinking it would be fun to make a wee folk gingerbread boy with pipe cleaner bendy inside and mostly felt cookie covering. You’ve inspired me! This book is a visual delight. I could spend hours with my grand daughters exploring each page. It looks like a delightful book! I have afriend who has lived in San Francisco, is a talented illustrator, and a grandfather. I would love to win the book and gift it to him. He would appreciate it on many levels, and love sharing it with his grandchildren. Enjoy your blog, thank you for giving us the chance to win this book. My granddaughter would absolutely love this! Thanks for the review and the chance to win. And thanks for your lovely blog! This looks like a must have for me and my grandson! It’s impossible to go wrong with an Elisa Kleven book. She’s an amazingly gifted author/illustrator and an entirely good person, too. We can’t wait to add this to our collection. It looks like a gorgeous book, Salley! Thank you for introducing us to her beautiful work! What fun! We took our children to San Fransisco 3 years ago and toured the Japanese Tea garden among other places in the book….what fun. Love the illustrations! Love your work as well! What a treat…thank you for sharing! Oh can that be our new mantra for the next four years? 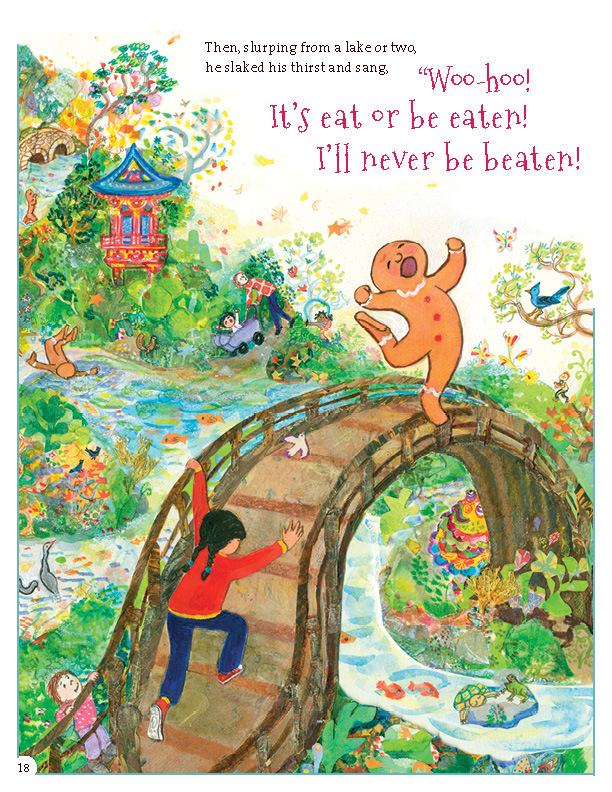 “I’ll eat or be eaten, I’ll never be beaten!” Lovely illustrations and I’m routing for the little guy! How lovely. Elisa Kleven is one of our favorite authors and illustrators. My twin girls absolutely adore Sun Bread and The Lion and the Little Bird. Please enter me in the drawing…lovely book! Would love to win since we do a lot with gingerbread around here during the holidays. Many thanks, Salley, for the honor of appearing on your gorgeous blog with my hungry gingerbread boy! I appreciate all the kind comments, too. You are so welcome, Elisa, it is such a pleasure! I hope it’s not too late to enter this drawing! This is a gingerbread Christmas at our house, and this book would be perfect for my soon-to-graduate from college (as elementary school teacher) daughter!